If you engage in forecasting real (news) events through 9 Stars 九星 and Luoshu 洛書, you want to know exactly how to then spot ‘9 Ki relevant’ images in your news media. That is, if you are like me and with pen and annual- and monthly Luoshu in front of you. While you accomplish this by knowing which (in)tangible phenomena to link to which one of 9 Stars, this is not that difficult a task in a Star 8 year. Star 8 is known for ‘revolutionary change’, so that, in our describing what news events to expect in a Star 8 year, we can come straight to the point. Pretty predominantly, you will not just see massive demonstrations, uproar and civil unrest, but outright public violence, rebellion, rioting and looting, on a global scale. But, tensions will revolve mostly around social, political, ethnic or religious lines, while we may see insurrection, segregation, declaration of independence, everything pretty much ‘territorial’. That’s not to start out on a negative note, but the reality is that Star 8 years come with ‘clock work’ (to this respect, you may check 1965, 1974, 1983, 1992, 2001, 2010), if it means that for some reason or another, people burst out as in ‘this far and not further’. Most notably also, Star 8 is in built structures, as in just buildings, real estate by and large, property. As I’ll explain, let’s first acquaint with Star 8 and look into its Trigram attributes. Star 8 White (Bā Bái 八白) is governed by the Gen Mountain Trigram – Gen Gua 艮卦. Its top line is the third line and the latest acquired. It is a Yang line (Yang Yao 陽爻), and it represents Heaven Qi – Tian Yuan 天元. 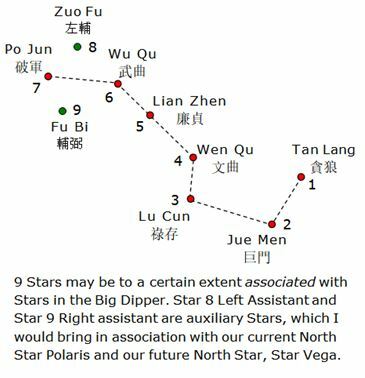 Star 8 is associated with planet Saturn (Tǔ Xīng 土星) and associated with Big Dipper as the auxiliary “Left Assistant” – Zuǒ Fǔ 左辅. The middle line in a Trigram is to represent Man Qi – Ren Yuan 人元 , and the first line at the bottom represents the domain of Earth Qi – Di Yuan 地元. Lines can be read top-down as Heaven-Man-Earth, or Time-Action-Space, so that Trigram Gen Mountain suggests something closed off from the top, then further hollow or empty inside, like a cave in a mountain or a comparable structure, a notion that may come in handy in your tracing of missing persons through 9 Ki Divination九星占卜. 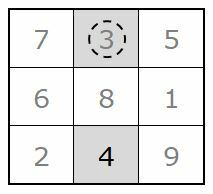 By way of its lower and middle line being Yin (Yin Yao 陰爻), Trigram Gen pertains to ‘open gate’, an unobstructed corridor or passageway, such as in a swimming pool, where there would be no demarcation between deep and shallow water. Gen Mountain Trigram will be admitting upwardly bound kinetic force, hence the notion of earthquakes or moving and trembling surfaces, landslides. As always, we will read into a Trigram from both its tangible and intangible properties. Essentially – and one of its most helpful notions in your divination -, Star 8 is in mountains, those noteworthy elevations in topography, including mountain ranges, ocean floor mountain and underwater chains of mountain. As you stay close to annual- and monthly Luoshu, you will not just follow a certain Star as it migrates through the monthly Luoshu, but both in your 9 Ki Divination for real (news) events, and in your following personal life progression, you will read into Star combinations. Star 8 may associate with land slides and mud slides, so that these images will stand out, certainly if Star 8 aligns with Star 1 in Luoshu. In personal 9 Ki Divination, Star 8 may bode your house, the building that you work in or that you are dispatched from. 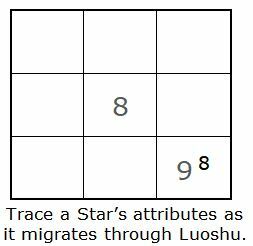 If Star 2 is your abode, then your actual house – the bricks of it – will be Star 8, so that you may be on the lookout for such Star combinations as 8-2. If Star 2 associates with inmates, then the prison building comes under Star 8. In mind properties of the Gen Mountain Trigram, some aspects about Star 8 may remain hidden, so that, what lies protected from the outside, may be kept from the public eye. It can be a cave in a mountain, but if it concerns a building, you may encounter events in the news to concern of built structures, furthermore those spaces inside those buildings where we would usually expect the ‘hidden’, e.g. laboratories, archives, classified documents. Insofar official buildings come under Star 8, to enter those buildings would probably require affiliation, not as accessible as perhaps buildings associated with Star 5, such as commuter stations. Thus, Star 8 may associate with governmental buildings, buildings to host sub-authoritative levels of leadership, universities, libraries, laboratories, places of science. Entryway into what lies hidden may need to be enforced, so expect news events around this type of attributes and understand why you will be seeing images of built structures under attack of a mob, or buildings being overtaken by a crowd. As said, Star 8 times may be notable for uproar, revolt, political unrest, more notably as it would seem, conflicts to concern of ethnicity. You’ll be able to get to more detail once combined other Stars with Star 8. For example, if Star 8 relates to revolution and change and the 6 Metal Palace is linked to labor strikes, then expect rather discontented people, labor unrest or uproar in the streets if Star 8 arrives at the 6 Metal Palace for a month, or with the combination 8-6 anywhere in Luoshu, for that matter. In a Star 8 year, you may see a university in front of which will assemble protesting students, in order to invoke change, or a mob in front of an embassy, a gathering in front of a religious compound. We may then note Star combinations, to see certain news evolve, such as where Star 6 teams up with Star 8, as we may see an armed assault6 on a building8, while Star 3 can be a surge by uniformed personnel, say police3. Star 9 with Star 8 may be a building8 on fire9, while Star 9 may be in riot police, armored9 vehicles. The Star combination 8-1 may point to a flooded1 building8 or a seaquake1-8, while Star combination 8-4 may be in airfield, or an airplane4 to crash into a building8. Knowing that Star 8 strongly tends to conservatism, may be helpful as you follow real (news) events for a Star 8 year, as this may point to a tendency in society to grab back and rely on tested sources, known customs, ‘back to basics’, a surge in political and social conservatism, but a strong tendency at least to emphasize the ‘own’ culture, customs, religion, ethnicity, traditional music and art, the inclination to restore, rather than to build anew, to move to rural areas rather than to live in cities, to eat natural and more native food for health, rather than to indulge in chemically processed food. Before anything else, we may read Star 8 as ‘revolution’ and ‘revolutionary change’, which not only you may extend to a tendency to vote along conservative lines or in favor of those social, political, ethnic or religious parties proclaiming ‘own folk’ kind of issues, but matters can become rather insistent, such that old disputes – that we thought had been resolved 9 years, 18 years, 27 year or 36 years earlier – may well resurface during a Star 8 year. Star 8 years can be notorious for revolt, massive demonstrations gone violent. Stomach, Spleen, Pancreas, more predominantly Spleen, digestive system. Nose, small bones, fingers, toes. Star 8 is Youngest Son in the Yi Jing 易經 family, younger males, or in divination even young children or a male in general. Built structures, buildings by and large, real estate, property. Inheritance. Revolution, revolutionary change. Accumulated events coming to a break in trend, a climax, matters coming to closure. Notable ethnicity, religious and minority (territorial) motivated events of high impact. Rather notable in the news may be widespread and massive public uprising and uproar, to involve violence, violent attack, looting, rioting, plundering, arson, causing upheaval, mayhem, which would provoke intervention by riot police, the military. Also now with annual Star 5 on the annual Reversed Luoshu Axis, we may see coup d’etat, curfew, martial law. (In)voluntary burning of old bridges, involving transformation. Mountains, mountainous area, prominent hills, elevated grounds, mountain house, cave, mountain animal. Small stones, stony path, clay. Cemetery, burial place. Open gate, unobstructed passageway, doorway, corridor. Ocean crust, earth crust, volcano, earthquake, landslide. A sense of spiritual deafness among people. Immovable. Sudden stillness. May anticipate fairly major – either voluntary or involuntary – change when your Star resides in the Star 8 Luoshu Palace. Good for contemplation on matters of existential interest that would yet need countered by philosophy, religion, changing food routines or making drastic decisions. You may obtain or need let go of material goods such as your house, land or you may be eligible for inheritance. Burning of old bridges, which means matters that were long established – and taken for granted – may now meet with lasting change. Can change religion, convictions, status, career, dietary habits, start or termination of relationship, move house or other events that may yet instigate and color the following 9 year cycle. Decisions may be forced upon you. You need to rely on your sound judgment, and keep to inner faith. Can be taxing on your tolerance, motivation, attitude, requiring that you trust Change (Yi 易). You may soon find this 9 Ki Divination syntax one of the most exciting. Now that by far most – if at all anyone exempt – in the field of 9 Stars and Luoshu forecasting would still point to the ‘central’ Star in the ‘central’ Palace to ‘tell events’, let me be inspiring you to take a whole new approach, but one that will boost your accuracy in 9 Ki Divination immediately and if fact quite decisively. Outside Luoshu as such is not a Magic Square, and there is no such thing as a ‘central unit’ reserved in Luoshu to accommodate ‘central Star(s)’, in forecasting real events by the hand of 9 Stars and Luoshu, much more far-reaching than to involve the ‘central Star’, is the dynamic of Reversed Luoshu Axis, by the hand of which, once aware of this dynamic, you’ll be able to much better recognize the hand of 9 Stars in real (news) events, as in fact, it makes all the difference. In short, Reversed Luoshu Axis occurs when a Star arrives from opposite its original Palace in Luoshu for a year, month or day. With the exception of just the basic Luoshu of 5 Yellow (Wu Huang 五黃), this occurs in every annual-, monthly- and daily Luoshu. As perhaps most 9 Stars practitioners would zero in on annual Star 8 (8) in this annual Luoshu, I like to draw your attention to annual Star 2. Annual Star 2 appears in the Star 8 Palace, from opposite its original position in the Kun Palace. The annual Reversed Luoshu Axis occurs Northeast-Southwest, as such instigated by annual Star 2, which will position annual Star 5 into opposite Luoshu Palace. Consequently, properties linked to annual Star 2 will be ‘magnetically off’, while in its slipstream, properties linked to annual Star 5 will be ‘going nowhere’. 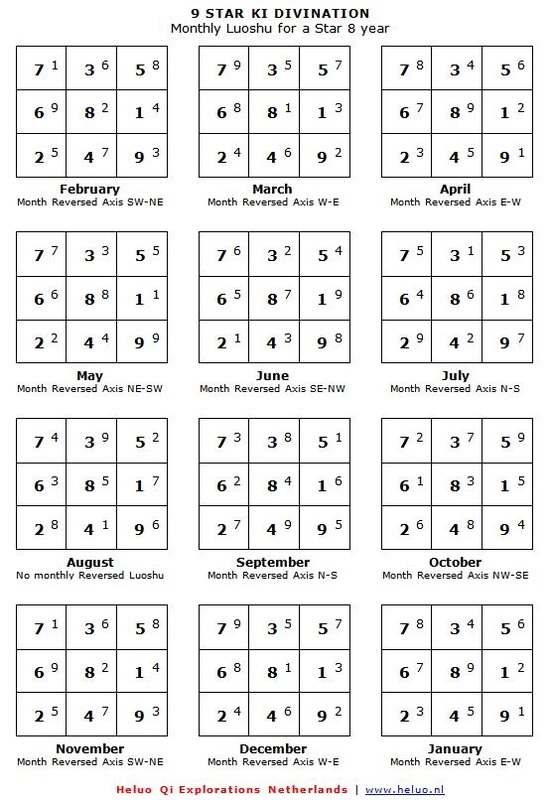 The first thing that you want to note is, if your Star resides on the annual Reversed Luoshu Axis, while you select those months and days that it would. Not just that, as just being (in contact) with someone whose personal 9 Ki Star is on a Reversed Luoshu Axis, might affect you. Such association may occur when your are physically around this person, or if just you spoke over the phone. One of my students who is a Star 9, reported how he was on an extended business trip in 2001 with someone whom he didn’t even know that well, who was a Star 2. Now that the annual Reversed Luoshu Axis in itself didn’t apply to his personal 9 Ki Stars, just by relating to a Star 2 person, he became involved. He tells me that, while they were staying in an apartment just temporarily, the house was suddenly raided by police, my student not aware that he had been traveling with a fugitive. 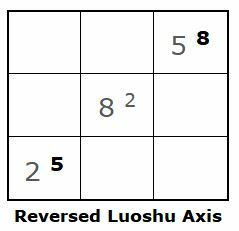 If you note your Star(s) on the annual- or monthly Reversed Luoshu Axis, while if you saw reason for doing so, you may just ask someone else to ‘buy the ticket’ in your name, or to arrange some important appointment. Most of the time, however, this will be not opportune, and you’ll be still undertaking your initiatives no doubt, while then perhaps you’ll anticipate and check and double-check if everything is on order. As said, attributes usually linked to annual Star 2 may be ‘magnetically off’, while attributes usually linked to annual Star 5 may be ‘going nowhere’. Star 2 portents may be hampered, challenged, while any first attempt may fail, while any next attempt may still reap success. Here then are some of the Star 2 and Star 5 attributes to be noted in the news predominantly. Woman, women’s interest, pregnant woman, womb, female working force, spouse, abode (not your house as such, which would come under Star 8 more, but where your bed is, where you dwell and feel at home). Educational field, school, teacher, student, study, the act of teaching, lecturing, counseling, (being of) support. Medical field, hospital(ization), doctor, nurse, (provision of) medication. Mob, homogeneous communities relying on central organization or kitchen, or sharing even only momentary social or political interest. Refugees, migrants, the notion of border, either explicitly or implicitly. Inmates (not a prison as such, which may come under Star 8 more), ship’s crew. Agriculture, farm, farming, crops, vegetable life, (failing) harvest, labor mines, labor mine workers, labor strikes, the act of provision, supplies, fueling, food and food distribution, famine, hunger strike, starvation, poisoning, environmental disaster. Fruit producing fields, including coal mines, but also sky (birds), sea, river and lake (fish), zoo, submerged hollow space, small house, cellar, village, rucksack or suitcase, locker. Surface relied on for protection, such as wall, dam, theater stage, ship’s deck, landing strip, landing gear, roof, balcony, pillar, tower crane, cherry picker. Star 2 appears from opposite its original Luoshu Palace, so that, in a matter of speaking, it will be ‘moving away from itself’. In fact, while such ‘move away from’ opposite Palace or Star(s) may be taken generically each time as you forecast by the hand of Luoshu Axis, this portent strengthened by the notion that Star 2 appears from opposite Star 5, which has ‘community’ as one of its associations, so that we may see Star 2 displaced. As annual Star 2 resides in the 8 Earth Luoshu Palace, as such up for ‘revolutionary change’ as it is, groups of people will be displaced, or being ousted due to annual Star 5. Note displacement or the evacuation of massive groups of people, be they refugees, migrants or groups of people that would formulate around any other line. Similar dynamics will come to you through your news media if you saw it mentioned ‘exile’. By and large, Star 2 governs just ‘mob’ or a ‘crowd’, as such separated from its usual association with the educational field, the medical field, civil servants or even a zoo. To that respect, any even only momentary gathering of people for as long as they share a common goal, organization or kitchen, may come under Star 2. Star 2 is good for female, female working force, so you may expect news to evolve around those associations. Also note ‘9 Ki relevance’ in your news media, once you saw labor mines or labor mine workers in the news in any shape or form. Note Star 2 for ‘wall’, or a border, border issues, but don’t let it escape your attention (easily to bypass, as it is one of Star 2’s most subtle – least known – properties), should news spring off your television screen that falls in the category ‘surface relied on for protection’. This ‘surface’ can be a ship’s deck, a theater stage, a balcony, a landing gear, but just so that you’d be noting it in real events. Besides food, the act of provision itself – by extension the act of fueling (not ‘fuel’ which would associate with Star 9 more) -, also resorts under Star 2, so you may expect events to concern of food supplies, supplies of medication, failing harvest. Star 5 – or 5 Yellow – may be associated with standoff, surprising events, from which there would seem no easy escape. Weird events, accidents, disaster, sudden unexpected but critical events. Ultimately, it may be in armed conflict, war, armed factions such as militants, paramilitary group, guerrilla combatants, rebel group, street gang, motorcycle gang. Military occupation, coup d’etat, martial law, curfew, ousted leadership, deportation, displacement. Construction related events, involving compounds made of stone, brick, concrete, rock, boulder, tunnel, cave, pit, basement. If Star 5 resides in the 9 Fire Luoshu Palace, it may portray an overhanging structure, while if Star 5 resides in the 1 Water Palace, we may see the fall into depth of a structure, such as a bridge. Publicly accessible buildings, commuter stations, city square, platform, parking lot. Star 5 can be a community, that you are a member to. Government related, sovereignty. Judicial trials of enormous proportion. If then we saw that Star 2 relates to a group of people, this can be occupants of a country or a region, migrants or refugees, while if then Star 5 bodes a community, we may note ousted people, massive displacements. Annual Star 5 can instigate the most marvelous events, or take mankind to great heights, while here we will note annual Star 5 for its more detrimental effects, such as it may cause fait accompli, surprising events from which there will be no breaking free. Star 2 has its original Palace overtaken by annual Star 5. In world politics, Star 5 handles sovereignty, also such that Star 5 may involve in coup d’etat, martial law, state of emergency, curfew, ousted leadership, shift in power, the act of armed conflict or occupation. Star 5 can also involve in merges and corporate take over, so you may anticipate on news to concern of educational field, the medical field, large corporations. Now, as I’m known for steering clear rather stringently from taking any Star for its more infamous capacity, and as not we may step into ‘predictions’ of sorts, but for the 9 Ki adepts among us, let’s for the occasion take Star 5 for ‘armed conflict’, ‘occupation’, or ‘war’. Then note that in the Star 9 year, just prior to this Star 8 year, annual Star 5 had resided in the Star 1 Palace, then let’s take this Luoshu Palace for ‘hibernation’, or ‘subside’ or ‘withdrawal’, whatever works for you. While with Star 5 in the Star 1 Palace, there could still occur armed conflict – it is not that -, but more likely would matters limit to just rhetoric. While still there might be ‘tension’ in the air with Star 5 in Kan Palace, it is more likely that armed conflict would have not actually manifested. In a Star 8 year, not only would annual Star 5 ‘escape’ hibernation, having now earned back much of its innate ‘radiance’, we once more note that it appears on the annual Reversed Luoshu Axis. In mind annual Star 2 into opposite position, then noted for its attributes, you would be on the lookout for armed conflict, occupation, coup d’etat, martial law and the like. In mind only the Northeast-Southwest Luoshu Axis, we may note February and November of a Star 8 year. During a Star 2 month, monthly Star 8 instigates the monthly Reversed Luoshu Axis. If not annual Star 5 already resided on the annual Reversed Luoshu Axis, it now also aligns with the monthly Reversed Luoshu Axis. There will be no way around challenging events in the media to concern of Stars involved. Now that Star 8 is known to invoke drastic change, if taken to the political arena and to those images that you will be likely to note in your news media, Star 8 is in public uproar and riots, not so much those involving just a handful of people or your odd demonstration here and there to concern of smaller issues, rather, those public upheavals that are meant to enforce change, then probably such change achieved. You may expect to see the masses clash in the streets, often in front of or targeted at buildings, but you may also see fierce ethnic clashes (compare other Star 8 years), for no other reason than ethnicity, or to secure the own tradition. In the February and November Luoshu, note monthly Star 5, as it joins annual Star 2 for a group op people, which can be migrants, civil servants, students, medical personnel, women, labor mine workers, a zoo. Star 5 can represent a stalled situation from which there is no breaking free, or fait accompli. Star 5 can bring out marvelous things and take mankind to moral and technological heights, while it is notorious also for causing mishap and disaster of sorts. While Star 8 can be conservative, Star 5 can be egotistical, it likes armed conflict. You may be seeing images to concern of different ethnic groups, groups of people seeking refuge, being displaced and the other party not asking politely. As always we just superimpose annual-, monthly- and daily Stars over the basic Luoshu of 5 Yellow. On the left are properties for the basic Luoshu of 5 Yellow, on the right overview of some of the annual Stars’ most basic attributes, transported to the respective Luoshu Palaces for a Star 8 year. Said differently, the basic properties of the Luoshu Palaces always in place, annual Star 7 takes its attributes to the Star 4 Luoshu Palace, annual Star 3 takes its attributes to the Star 9 Luoshu Palace, and so forth. As properties of the Luoshu Palaces (Host), then associate with attributes of annual-, monthly- and daily Stars (Guest), you’ll see real events to evolve accordingly. Annual Star 3 in the 9 Fire Luoshu Palace: be on the lookout for news to concern of police3, the more if something will come to exposure9. Star 3 also pertains to train, railway industry. Annual Star 4 in the 1 Water Luoshu Palace (for ‘loss’, depth, fall into depth): expect incidences to involve space science4, airplanes4. Can see bankruptcy1 in airline4 industry. Let’s describe ‘Luoshu Trend’, then look at annual Stars 2 and 5 a bit more also. Now that we emphasized on Reversed Luoshu Axis, that will be back to the ‘central Star’ for a Star 8 year. We will still very much see news to evolve around properties of annual Star 8, but for different reason than perhaps widely presumed. If asked a group of 100 people “which Star in Luoshu would be strongest, the most influential?”, chances being that 100 people will point to the central Star for that. 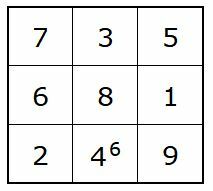 Whereas a Magic Square of Three – just as any odd numbered Magic Square – hosts a central unit, Luoshu of course is not a Magic Square as such, as it is to just facilitate eight 45 degrees sections, producing a ‘dot’ as its geometric center at best, which is same as in saying that there hasn’t been any such thing as a ‘central unit’ reserved in Luoshu to accommodate Stars. This may be against popular belief or against what you had gathered about 9 Stars and Luoshu sofar, but it is critical once it is your wish to engage in forecasting news events. In fact, in portraying Luoshu, we only sketch a central unit for sake of convenience, while it is rumored that it was Feng Shui master Tang Yang Wu to first introduce this practice around 1923, as he started to publish Feng Shui books and began to popularize Chinese Feng Shui by teaching classes. If not we were to portray a ‘central unit’ to host Star(s), we would soon need take one of 9 Stars as the odd one out as a side-note to our little finger. The then apparent central Star takes in no direction, as it is taken from out of the directions, as it is to in fact represent energy to currently descend from heaven. Now that annual Star 8 descends from heaven, to splash down on earth, so to speak, it then assigns ‘duty’ to the other Stars, while it cannot cast its influence from out of the eight directions, so that – on the contrary – Star 8 attributes become more prone to attracting incoming influences from the surrounding Stars. This is why in a Star 8 year, we will see news events revolve around Star 8 properties, which is a notion we may baptize ‘Luoshu Trend’, just as comparatively in a Star 1 year we may say ‘water in the streets’, or in a Star 3 year we may say ‘police in the streets’. Luoshu Trend for a Star 8 year may be ‘stones in the streets’. The ‘central’ Star may indicate what may be markedly in the news, not because it was the strongest – most influential – Star, but because it had momentarily not its attributes represented from out of any of the magnetic directions, therefore it is prone to events. Therefore, if Star 8 relates to built structures, just buildings, then more than in other years, you may see buildings to involve in events, accident, trade. Another typical Star 8 ‘Luoshu Trend’ will be in earthquakes and land slides. As noted earlier, and quite prominently indeed, events will evolve around revolutionary change, such invoked by protests, rioting and looting, more so violent clashes between groups identified along lines of ethnicity, nationality, religion, political views, social division, civil liberties, culture. These groups would have typically just either co-existed in peaceful accord, or some long past issues may re-emerge and weapons dug up, unannounced, and with a tenacity that would be astounding, it is there all of a sudden and in most cases seemingly ‘out of nowhere’. Apart from demonstrations and uproar to involve your odd student marches, we had linked Star 2 to homogeneous groups, so that you’d see nasty images of groups fighting over ethnicity, religion, culture, civil liberties, such not limited to street violence, but in particular involving and entering buildings. You may see this for one city with a certain monthly Star, then for another region with monthly Stars changing, but the gist will be there. At that time not involving monthly- or daily Luoshu, each time as you sketch an annual Luoshu, you will project the basic Luoshu of 5 Yellow, such that we see annual Star 4 to appear in the 1 Water Luoshu Palace, thereby combining portents of annual Star and Luoshu Palace. If the Star 1 Palace not only associates with H2O, but a depth or a fall into depth, while Star 4 associates with airplane, we may see an airplane crash into water. That said, to come to a forecasting by just linking a single Star to a single Palace ‘will not do’, and such a convention – albeit wide spread still today – will have been surpassed by much better. 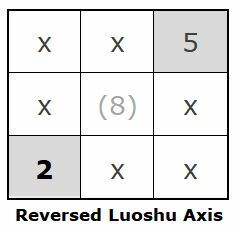 If we stay with the above example of an airplane crash into a depth or into water, forever note that Luoshu is about ‘axes’, until opposite Luoshu Palaces are always considered in relation. You will find that, perhaps one of the most exciting things about at all reading Stars and Luoshu onto real events is, that not only would a ‘single Star in single Palace’ approach already reveal ‘airplane crash into water’, we’ll only have the opposite Luoshu Palace and Star(s) to then give us more detail. Said differently, it is one thing to know that a certain event had occurred, it is something else to establish what had caused the event. We say that “nothing to befall Subject Star with not the opposite Palace and Star(s) having a direct hand in affairs”, so that by this example, annual Star 3 and annual Star 4 appear on the same Luoshu Axis. In fact, it’s not like we would still ‘first’ note the single Star in the single Palace to ‘tell the story’, then somewhat later we involved opposite Palace and Star(s), but we actually involve opposite Palace and Star(s) right away and throughout our divination. Consequently, our Subject Star 4 will be here affected by annual Star 3 (Zhen Gua 震卦 for o.a. electricity), which would be within context suggestive for short-circuit. Should Star 2 appear same Luoshu axis, this may be suggestive for failure in fueling, while Star 7 would be suggestive for a rupture of sorts. Other news to note to concern of annual Star 4 will be in projectiles, space science, documents by and large, world trade, so that you may expect news to that respect. In a Star 3 month, monthly Star 7 will visit annual Star 3 in the 9 Fire Luoshu Palace. Now that Star 3 relates to uniformed personnel, such as police or railway personnel, it also relates to train. One of Star 7’s associations is knife or sword, so you may expect a stabbing incident to concern of police, in a train or at a railway station. With this Star configuration, we have even seen incidents involving fake knives and fake swords. In a Star 1 month, monthly Star 6 will visit annual Star 4 in the 1 Water Luoshu Palace. Star 6 can be taken for a car, bus or truck, while the Star 1 Luoshu Palace associates with depth or fall into depth. You may expect cars to plunge into a river or ravines notably this month. We may note Star 6 for armed assault also, so that this month you may see such incident to concern of children in the age group 0-12 (Star 4). It will be undoable to give samples of all the news that we might see occur with just any possible annual-, monthly- or daily Luoshu. Still, to get you on track, and only so as in helping you ‘recognize’ 9 Ki relevant news events, each time as they occur in your news media, I’ll quickly describe certain Star configurations known for certain ‘typical’ events. Each time as we point out a combination between Star and Luoshu Palace, for example annual Star x and monthly Star y in the Star z Palace, similar may occur with Star combination x-y elsewhere in Luoshu, or – as you will note – certain Stars to appear from opposite position in Luoshu. Monthly Star 2 associates with ‘surface relied on for protection’, and it appears from opposite monthly Star 7 for a.o. ‘demolished structure’. You may be on the lookout for a ‘collapse’ of sorts, the break of a dam, a roof, a flooring. Can have incidence to involve a zoo2 or a zoo animal. Likelihood for earthquake, now with annual Star 3 and monthly Star 8 to appear on same Luoshu Axis. Added to this that annual Star 4 in the Star 1 Palace (1-4) is ‘good’ for torrential rains, typhoon, may involve flooding, Tsunami. May be a seaquake (Star 8 in Star 1 Palace), notably affecting island1, coastal area1, peninsula1. To round off this slight forecasting for a Star 8 year, and only to just show you a dynamic, we may grab back on some ‘typical’ events in earlier Star 8 years. Can I first ask that you take a glimpse at these sample Luoshu, then note the common denominator. Let Star 4 represent ‘airplane’, while Star 8 ‘building’. You’ll see Star 4 and Star 8 to meet up anywhere in Luoshu, as one Star visits the other Star’s Luoshu Palace, or as Star 4 and Star 8 might position from opposite Luoshu Palace. Let this not be a prediction, as there is no such thing in 9 Ki Divination as ‘this Star must cause that…’, but it is a random selection of incidences to involve airplane for Star 4 and building or mountain for Star 8. Again, this is not a done deal, but it falls in the category ‘typical’ and too ‘good’ not to be showing you. Some of associations if you locate these Star combinations anywhere in an annual-, monthly- or daily Luoshu, or if these Stars appear from opposite position in Luoshu. 8-1 Seaquake, involving ocean floor, earthquake with epicenter in sea. Earthquake involving island, delta, peninsula. Events to concern of inland water, water reservoirs, harbor, river, ravine (depth, fall into depth), sewerage system, tunnel, underground cavities. If besides Star 1, there appears Star 4 for turbulence – directly or indirectly -, may see typhoon, hurricane, tsunami. 8-2 Small villages and small houses affected, school, hospital, prison, zoo, agricultural fields, farmland, plot of land, submerged hollow space, labor mine, cellar. Star 2 governs ‘surface relied on for protection’, such as wall, dam, dike, roof, flooring, balustrade, balcony, landing strip, landing gear, ship’s deck. Star 2 covers school, teacher, student, the medical field. Star 2 associates with a mob, refugees, migrants, so may see groups of people relocate. Star 8 or Star 2 accompanied by Star 1, may further give landslide8-1, mudslide2-1. 8-3 Where Star 8 reaches deep into earth, Zhen Gua for Star 3 can be in what disturbs the earth, as Star 3 is shaking, piercing, roaring, unstoppably invasive. Whereas Star 3 may vanish as fast as it came, in the meantime it may cause for undeniable damage. Earthquake causing Tsunami, frequent aftershocks, highways, high rise buildings, electrical power plants, electrically engineered machinery, railway or subway station, train, railroad, forest. 8-4 Earthquake8 affecting airfield4, air traffic, obstructing world trade, transportation and infrastructure for communication. Wooden structures, library, archives, places where children age 0-12 gather. Missile plant, wind park, Ferris Wheel, roller-coaster, ski lift, elevator. 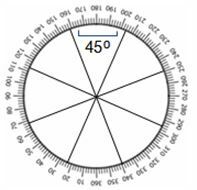 As Xun Gua for Star 4 indicates Wind, it may provide turbulence, excitement of air, funneling, anything airborne or anything traveling through air from point A to point B, which can be ashes, smoke, rubble, so can affect or obstruct air travel. 8-5 Star 5 bodes publicly accessible places, flat surfaces such as a city square, parking lot, commuter stations, cave, bunker, compounds and constructions made out of brick, concrete or stone. Earthquake to damage such infrastructure as bridges, tunnels, highways, while we may see massive displacement of people. 8-6 Affecting domed structures such as a sport stadium, steel structures, military compounds, ammunition storage, factory buildings, motor vehicles. Government or legislative buildings, corporate building, silo of sorts, car or arms factory. Otherwise, Qian Gua for Star 6 is in armed assault and explosives, Star 6 is in unrelentless and fairly merciless battering. 8-7 Overall, and besides Star 7 involving the financial industry, Star 7 is in ‘demolished structure’ and rupture. Insofar Star 7 taken within context of ‘places for financial transactions’, may affect financial district, bank, shopping mall, supermarket. Star 7 represents sailing vessel, which may extend into ship building plant or harbor. 8-8 Massive earthquake, affecting a wide area and with many equally significant aftershocks, causing landslides. As Star 8 denotes built structures in general to begin with, earthquake may damage buildings and highly populated areas, notably those in mountainous areas. 8-9 Earthquake to cause for an eruption or a blaze, affecting chemical or nuclear facilities. Strong indication for volcano eruption, building8 on fire9 or oil9 platform8. As you follow real events through your news media, you want to be able to pin down certain ‘typical’ buildings and facilities pertaining to 9 Stars. Swimming pool, aquatic ground, liquor plant, water basin, religious building, art museum, nuclear plant, drugs & pharmaceuticals, pharmacy, brothel, abortion clinic, grave yard, asylum, platform in water, pit, ravine, fish auction, bar, sewer. Farm, agricultural field, labor mine, ocean floor, school, teacher, student, hospital. Surface we rely on for protection: balcony, ship’s deck, landing strip, balustrade, stage, wall, dam. Small house, village, cellar, cave. Homogeneous group relying on central organization or kitchen: ship’s crew, evacuees, refugees, inmate, mob, zoo. Railway or subway station, train, police station, high rise building, erect buildings, highway, army base, university, computer technology, electrical power plant. Facility for children age 0-12, media, post-office, airport, missile launch facility, wooden shed, stock market, library, archives, travel agency, transportation. Publicly accessible compound, commuter station, city square, parking lot, tunnel. Military bunker, ammunition storage, arms factory, government or legislative building, corporate building, palace of sovereign, metal bridge, auto repair, car. Bank, venue for financial transactions, shopping mall, theater, house of pleasure, ship, ship building plant, harbor, hide out, demolished site, open roofed building. Prominent building, house, plot of land, angry crowd, science center, laboratory. Fuel station, oil platform, film studio, drugs and pharmaceutical plant, pharmacy, chemical or nuclear plant, excavation site, armored building. 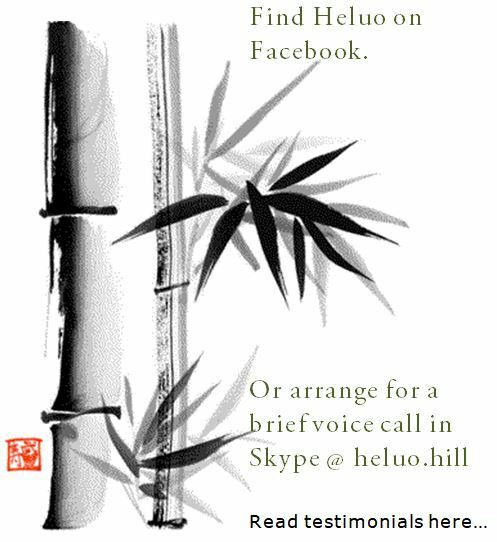 Heluo (Roel) Hill has been studying and practicing Chinese metaphysics since 1973. He started teaching and life counseling in his martial arts center in 1979, which was also the year when he took up on Nine Star Ki Astrology during a seminar with Michio Kushi. As he noted much greater relevance between 9 Stars and real (news) events than apparently had been noted in literature at the time, he began to incessantly mirror annual-, monthly- and daily Luoshu against news progressions in 1988. He has not been without 9 Stars and Luoshu for a single day since. He was able to develop the art of forecasting real events and personal life progression past-present-future by the hand of 9 Stars and Luoshu, laying bare such new syntax as Reversed Luoshu Axis, Luoshu Trend, In Prison-Out of In Prison, the notion to always read for opposite Palace and Star(s) in Luoshu. Today we distinguish between Nine Star Ki Astrology and 9 Ki Divination. Heluo has been with his vocational study program Professional Destiny Consultant since 1997, teaching 4-day master classes and distance learning in 9 Ki Divination, Four Pillars of Destiny Bazi, Flying Star Feng Shui and Nine Star Ki Astrology. Each one of 4 topics of study will be transmitted in full, in one gathering (no modules), and one-on-one. Heluo Qi Explorations Netherlands offers intensive 4-day master classes in our permanent class room in the city of Heemstede, and distance learning along direct teacher-student interaction in 18 weeks. Professionals in metaphysics, his colleagues, students from 36 countries rely on Heluo for profound and no-nonsense training.